The world's first meteorological satellite was launched from Cape Canaveral on April 1, 1960. Named TIROS for Television Infrared Observation Satellite, it demonstrated the advantage of mapping the Earth's cloud cover from satellite altitudes. TIROS showed clouds banded and clustered in unexpected ways. Sightings from the surface had not prepared meteorologists for the interpretation of the cloud patterns that the view from an orbiting satellite would show. 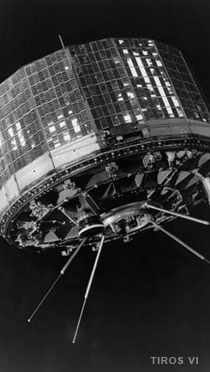 From April 1, 1960 to July 2, 1965, ten TIROS satellites were launched. The satellites ensured continuity of data throughout the early years. The first four TIROS satellites had an inclination of 48 degrees and the next four had an inclination of 58 degrees, thus they were not polar-orbiting. The last two TIROS were the first polar-orbiting meteorological satellites. The next series of satellites, named ESSA (for Environmental Science Services Administration) were launched from February 3, 1966 to February 26, 1969. Nine satellites in the ESSA series were launched during this time. These satellites were also polar-orbiting satellites. On January 23, 1970, the first of the improved satellites was launched. This satellite was named ITOS 1, for Improved TIROS Operational Satellite. Between December 11, 1970 and July 29, 1976. Five ITOS satellites designated NOAA-1 through 5 were launched. NOAA-1 was the first satellite to bear the NOAA name and the first to be launched after the establishment of NOAA in October 1970. From October 13, 1978 to July 23, 1981, satellites in the TIROS-N series were launched. The N represented the next generation of operational satellites. NOAA-6 and NOAA-7 were launched during this time frame. Flight of the AVHRR (Advanced Very High Resolution Radiometer) and TIROS Operational Vertical Sounder suite started on TIROS-N.
On March 28, 1983, the first of the Advanced TIROS-N (or ATN) satellites designated NOAA-8 was launched. These satellites are physically larger and have more power than their predecessors to accommodate more equipment. Page updated on April 24, 2013.